Door Step School, along with Quest Science Lab and Vibha Volunteer Group, organized a Science Quiz for children living on construction sites in Pune. 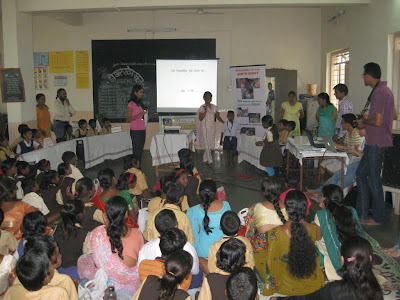 Around 100 school-going children from different construction sites participated in the quiz held at Golwalkar School, Aundh on Sunday, 21st October 2012. The quiz was conducted in two groups - Junior (age 6 to 10) and Senior (age above 10). Most of these children attend Quest Science Labs in Aundh and Pashan. Questions were asked related to Science, Maths, and General Knowledge. The teams were named after famous Indian scientists, such as APJ Abdul Kalam, Ramanujan, Homi Jehangir Bhabha, and likes. Apart from participating teams, the audience, too, was well prepared to answer the questions. One team from each of the two groups was declared as winner. However, main objectives of the quiz were to encourage children for public speaking, and to evaluate their capability of applying at right time, what they have learnt. Mrs. Rajani Paranjpe and Jayashree Joglekar from Door Step School were present at the venue to appreciate efforts taken by children and their teachers. The team of Quest Science Lab, led by Malati Kelkar, helped in setting up the question bank. Entire organization of the event was done by Janardan, Neha, Anjeli, Akshat, and other Vibha volunteers. All children enjoyed the quiz, and the winners returned to their homes, flaunting their medals!